Danke to Planet F1 for the link. Asked whether there was some relief that he wasn’t racing for McLaren at this time, Hamilton said: “No, I don’t look at them and think I’m happier. “I look at our performance and realise just how good of a choice it was obviously. When you hate me, it gives me power. 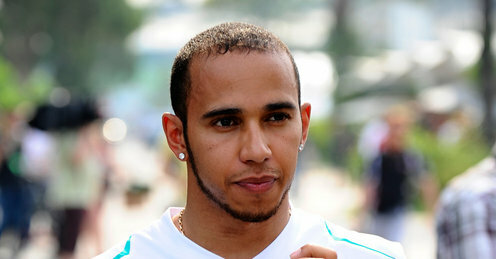 Hamilton insisted that McLaren will recover from their Australian slump which he billed as a “little blip” for the Woking outfit. HAM: I’m completely obsessed with their failure. If I didn’t look at them as a reference, I wouldn’t be able to realize that I’m happier or know that we’re performing better. They’ve always been very strong at catching up, except, um, last year, when they were sabotaging me and I was sabotaging them and none of us would acknowledge it. I’m sure they’ll catch up. No, I’m not taunting them. I’m being supportive. Supportive to my old team. Whom I don’t look at. I operate on higher plane of existence where I’m throwing a ball for Roscoe and Nicole is blowing me while I accept holy communion from my priest/agent. This entry was posted in F1 Drivers Translated and tagged Australia, Formula One, Hamilton, Jenson Button, Lewis Hamilton, McLaren, Sergio Pérez, Woking by Fygar. Bookmark the permalink.